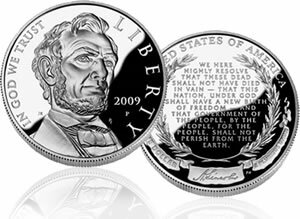 The bicentennial celebration of Abraham Lincoln’s birth kicked off in earnest on his birthday, Thursday, Feb. 12, with the launch of the 2009 Lincoln Commemorative Silver Dollars and the release of the first of four newly designed Lincoln cents. 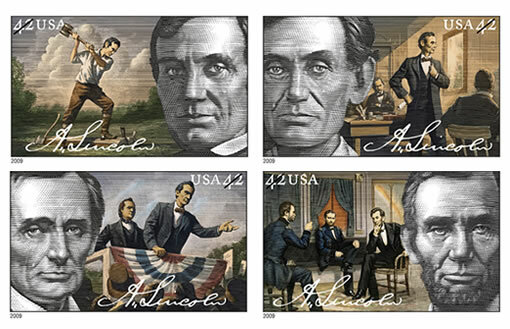 The release of four new First-Class Lincoln commemorative stamps on Monday, Feb. 9, started the celebratory ball rolling. Abraham Lincoln (February 12, 1809 – April 15, 1865) was the 16th President of the United States, and is often ranked 1st or 2nd — sometimes following George Washington — by Americans when asked who was the greatest president. Lincoln led the Nation through the Civil War, issued the Emancipation Proclamation in 1863 that declared forever free those slaves within the Confederacy, and promoted the passage of the Thirteenth Amendment to the Constitution, which abolished slavery and was passed several months after Lincoln was assassination at Ford’s Theatre in Washington by John Wilkes Booth. "I was born Feb. 12, 1809, in Hardin County, Kentucky. My parents were both born in Virginia, of undistinguished families–second families, perhaps I should say. My mother, who died in my tenth year, was of a family of the name of Hanks…. My father … removed from Kentucky to … Indiana, in my eighth year…. It was a wild region, with many bears and other wild animals still in the woods. There I grew up…. Of course when I came of age I did not know much. Still somehow, I could read, write, and cipher … but that was all." Lincoln married Mary Todd on November 4, 1842. He had four boys, but only the first son, Robert, lived to adulthood. Mary died on July 16, 1882, more than 17 years after Lincoln was assassinated. The 42-cent stamps — officially unveiled Monday at the Old State Capitol State Historic Site in Springfield, IL — chronicle Lincoln’s life as a rail-splitter, lawyer, politician and a president. The stamp art was drawn by Mark Summers of Waterdown, Ontario, Canada. In similar fashion, the four 2009 Lincoln cent designs also depict major aspects of Lincoln’s life: his birth and childhood in Kentucky, his formative years in Indiana, his professional life in Illinois and his Presidency in Washington, D.C.
"This is a momentous occasion in the history of our Nation’s coinage because these designs represent the first change in the Lincoln cent in half a century. These coins are a tribute to one of our greatest Presidents whose legacy has had a lasting impact on our country. He believed all men were created equal, and his life was a model for accomplishing the American dream through honesty, integrity, loyalty, and a lifetime of education." The commemorative silver coins are struck in both proof and uncirculated versions and have a different theme compared to the cents or stamps. Lincoln Silver Dollar designs were revealed by the Mint on November 19 during the annual Dedication Day Ceremony at Soldiers’ National Cemetery in Gettysburg. The timing was particularly appropriate as it was the 145th anniversary of the cemetery’s dedication by Lincoln and his historic Gettysburg Address. The final words of which are inscribed within a laurel wreath on the Lincoln silver dollar reverse. 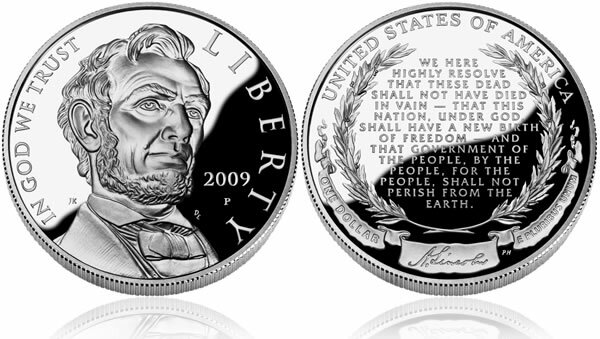 The obverse, or "heads" side of the coin portrays Lincoln, and was inspired by Daniel Chester French’s famous sculpture of the President inside the Lincoln Memorial in Washington, D.C. It was designed by Justin Kunz and engraved by Don Everhart. * Up to 500,000 across all product options, including the special set. ** The price and launch date for the special US Mint Lincoln Coin and Chronicles Set is Oct. 15 at noon ET. 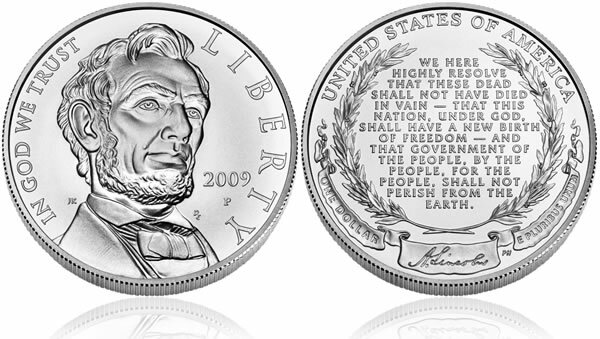 I need one each of the proof and uncirculTED LINCOLN SILVER DOLLARS! You can buy the Lincoln Silver Dollars through the links above. The cents are hard to come by. The mint doesn’t sell any (at least yet) and many banks do not have them. 2009 circulating pennies should be plentiful several months ahead. what is the weight of this coin ? Well, it is Feb 28 and the Silver Dollar is going for 150 or more on ebay! I ordered 2 from the mint. This has got to be the neatest coin I ever seen. Just received my Lincoln dollar from the mint. This coin is awsome in design and luster. The image of Lincoln is breath taking, the mint hit a Home run with this coin. Considering the mint won’t start shipping the Lincoln dollar until March 13, 2009 you couldn’t possibly have one,. Actually, many thousands have already shipped. The Mint simply is in “backorder” status now for new orders, which has become common. 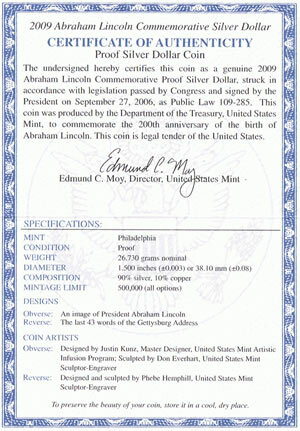 Actually I receive my both the proof and uncirculated on 3/2/09 directly from the Mint. However, I place the order early on the release date, though. To all those who may think that no one has received the 2009 Lincoln commemorative silver dollar, you are wrong. I placed an order when the mint first made it available to order, I placed the order, forgot about it and one day on my doorstep was a box that had no indication of from the mint (not packaged in the typical box the mint normally sends) and inside this over-sized box was the 2009 Lincoln PROOF commemorative silver dollar…. I am very glad I placed that order because this is the COMMEMORATIVE OF ALL COMMEMORATIVES… This coin is without a doubt the best looking coin I’ve seen let alone the reverse with words that give me chills every time I read them. People back then knew how to phrase with feeling!!!!!! I checked the mint and it seems they have stopped filling orders until sometime in April. My guess is: there must be a shortage of “SOMETHING” can you say Ag.???? Pardon my ignorance. I was just late getting my order in. I didn’t know they had already shipped some. I can’t wait to get mine. Thanks for the info. We received our first Lincoln Commemorative toward the end of March, liked it so much that we ordered three more and was notified yesterday that they had been shipped. Same experience as Vidal, one coin in a very large box. Beautiful commemorative coin, great detail!